See the media page for more new photos! Photo credit for this recent shoot go to the very talented Liz Beddall. "For the Indigenous peoples of North America the thunderbird is part of their cultural story. For Marion Newman, a British Columbia born mezzo-soprano with Kwagiulth and Stó:l? roots, the Thunderbird is a piece of music that she performs. This week in a concert of "stormy" music with Thirteen Strings, she'll be singing the piece. She talks about the music and her perspective on classical music, Canada 150 and reconciliation with Indigenous peoples in this email interview with ARTSFILE's Peter Robb." This December Marion is switching up her holiday tradition of singing Handel's Messiah to embark on a wonderfully fun adventure with Toronto Masque Theatre. Come enjoy a Newfoundland Kitchen Party with wine and grog, in the tradition of mummering. Music, Dancing and storytelling in the Enoch Turner Schoolhouse near the Distillery District of Toronto. Pictured here: Larry Beckwith, Giles Tomkins and Marion Newman in a very serious artistic photoshoot for Mummer's Masque by Dean Burry. Does it get any more Canadian than this? 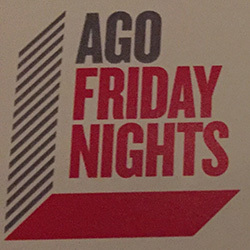 THE REVIEWS FOR AGO FRIDAY NIGHTS ARE IN! "Marion Newman’s way with the words is top-notch. Her voice rings out thrillingly in the Walker Court, especially when she moved around during Carmen’s Habanera." "Mezzo-soprano Marion Newman was the featured soloist after intermission. The venue gave her beautiful mezzo added resonance; She sang a variety of pieces by Schubert, Bizet, Purcell, Elgar, as well as two short pieces composed by Sherkin for the occasion... Overall, a most successful new venture by the AGO." 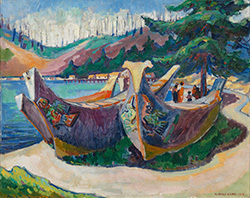 Explore the lush world of British Columbia through the eyes of the iconic Canadian artist, Emily Carr. This concert includes readings from Klee Wyck, music of Canadian composers Tobin Stokes, Anna Höstman and Dustin Peters as well as Marion's own composition, Kinanu. This concert works beautifully for orchestra as well as for the more intimate piano and hand drum setting. For more information and bookings contact Kathy Domoney, director of Domoney Artists at 416-882-4382. The Continuum Ensemble has posted a video of the entire concert performed in December 2013. This wonderful set of 11 pieces for 7 players and mezzo-soprano is a response to the people, environment and spirit of Bella Coola, BC. Several years ago, during an opera workshop, it came to light that Bella Coola is the valley where Marion was born and where composer Anna Höstman spent her childhood. Anna collaborated with Dylan Robinson and Patrick Nickleson as well as Marion while she created this work. ROSINA IN THE BARBER OF SEVILLE! "The season opens in September with a version of Rossini’s opera buffa The Barber of Seville set on a 1940s film set in Spain then ruled by the dictator Francisco Franco. But this performance is all about the comedy. In this version, the central female character Rosina is a young actress in a movie about Carmen. The barber Figaro is in this instance a studio stylist and Bartolo, Rosina’s domineering guardian, is this time around the head of the film studio. “It’s ridiculous but it’s hysterical,” Mallon says. The cast is also Canadian, with mezzo-soprano Marion Newman as Rosina, Pembroke baritone Joshua Hopkins plays Figaro, tenor Isaiah Bell as Count Almaviva, baritone Peter McGillivray as Bartolo, bass-baritone Giles Tomkins as Basilio, baritone Ben Covey as Fiorello and Ottawa-based soprano Maghan McPhee as Berta. 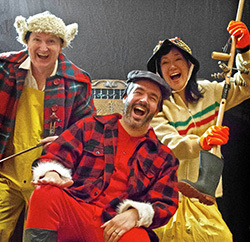 Performances are Sept. 26, 28, 30 and Oct. 3 in Southam Hall starting at 8 p.m."
Along with friends and colleagues Adam Sherkin and Kathleen Kajioca, Marion will present a concert on the theme of reconciliation. This concert will include the Kwakwala Echo/Sap'a song cycle by composer Dustin Peters, as well as Marion's own lullaby, Kinanu. As part of the 2017 VSO Symphony at the Annex series, Marion will perform composer Anna Höstman's work, Nuyam?-i? Kulhulmx – Singing the Earth. In this work, Anna has woven the surroundings and cultures of Bella Coola BC into music. Bella Coola is where Anna spent her childhood and incidentally, where Marion was born. This work includes an installation created by Anna Höstman, Dylan Robinson and Patrick Nickelsen. Marion is a guest artist with Victoria Symphony in a concert celebrating Canada's 150th birthday, exploring our country's rich literary community and connection to music. Curated by acclaimed novelist Jack Hodgins, Marion sings Tobin Stokes's "Klee Wyck" with text from Emily Carr's book; Tania Miller, conductor. Ottawa's thirteen strings will juxtapose the Aboriginal Thunderbird legend with baroque versions of Shakespeare's The Tempest by Matthew Locke and Henry Purcell. Combining dance, art and song Marion will is delighted to once again sing Dustin Peters' exciting work "Thunderbird". Marion is mezzo soloist in this magnificent oratorio, alongside Benjamin Butterfield, tenor and Gary Relyea, bass-baritone. Marion will sing the world premiere of a work by Maestro Bramwell Tovey, dealing with the very real and very important issue of reconciliation between our First Nations and the rest of Canada. 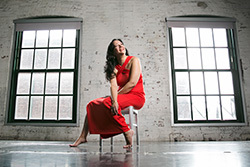 Marion sings the role of Sojourn in this new dance/opera work that strives to helps people feel the weight of the true history Canada shares with Indigenous people. Marion performs Bramwell Tovey's beautiful new orchestral song cycle Ancestral Voices for this annual Canada Day celebration in the breathtaking setting of Whistler. Tovey brings light to the very important issue of reconciliation between First Nations and the rest of Canada through through this set of four songs, written for Marion. Marion performs Bramwell Tovey's beautiful new orchestral song cycle Ancestral Voices as part of this tour of Kamloops, Kelowna, Penticton, Vernon and Chilliwack, BC. Tovey brings light to the very important issue of reconciliation between First Nations and the rest of Canada through through this set of four songs, written for Marion. Marion sings the role of Dr. Wilson in this new opera by Brian Current, composer and Marie Clements, librettist. Set in Vancouver's Downtown Eastside and along the Highway of Tears, this opera tells the story everyone knows from the vantage of a woman nobody remembers. Marion is alto soloist for this holiday favourite!